Conflict between the military and government factions is endemic. In 1946, the election of President Juan Domingo Peron began a period of authoritarian rule and heightened tensions between military and civilian forces. A military junta overthrew the government again in 1976. Both regimes employed civilian and military intelligence agencies in domestic espionage against Argentinean citizens and persecuted political dissidents. Democratic rule was restored in 1983. The new government overhauled government structure, separating civilian and military agencies into specialized, relatively autonomous units. In 1992, the government modernized and redesigned the nation's intelligence system. Argentina's intelligence community is divided into civilian and military branches. The civilian intelligence system operates under the direction of the executive branch of the government. The keystone of this network is the National Intelligence Center (CNI). The CNI is responsible for gathering information from various intelligence agencies and coordinating daily operations. In recent years, however, the power of the CNI has greatly diminished. The Office of the State Intelligence Secretary (SIDE) assumed many CNI duties. SIDE is the oldest Argentinean intelligence agency. Reporting directly to the President, SIDE is charged with culling domestic and foreign intelligence information with which to brief members of the executive branch. The agency also directs the nation's counterintelligence program. Domestic security was the primary concern of Argentinean legislators who pushed for intelligence reform in the early 1990s. To this end, passage of the Internal Security Law of 1992 created the domestic security service, the National Direction of Internal Intelligence. The agency, a subsidiary of the Ministry of the Interior, created national security policy and coordinates the protection of national interests with the aid of intelligence services and law enforcement agencies, such as the National Gendarmerie and Federal Police. Military intelligence is coordinated by the Joint Staff of the Armed Forces, and a subcommittee known as J-2 Intelligence. The committee reports to the executive, and like all military intelligence organizations is subject to congressional oversight review, but remains largely autonomous. Each branch of the Argentinean military, the Air Force, Army, and Navy, maintains its own intelligence services. 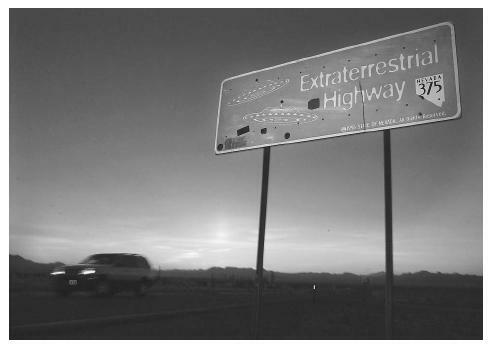 A car moves along the Extraterrestrial Highway, a roadway that runs along the eastern border of Area 51, a military base on the Nevada test site that the U.S. government has only recently admitted "officially" exists. In 2002, Argentina again began a period of political instability, in large part due to an economic crisis gripping the country. Until government stability is restored, the future of Argentina's intelligence agencies is uncertain. As in past periods of unrest, military intelligence and security agencies have gained power and influence, eliciting the concern of Argentinean civilians and members of the international community.